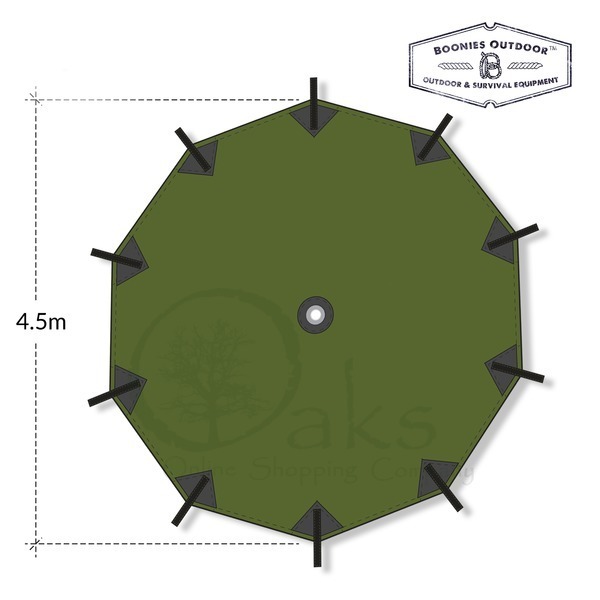 Forest School Shop round Tarps (also known as Parachute tarps) are the ideal solution for those of you who require a very large group shelter in the style of a parachute. 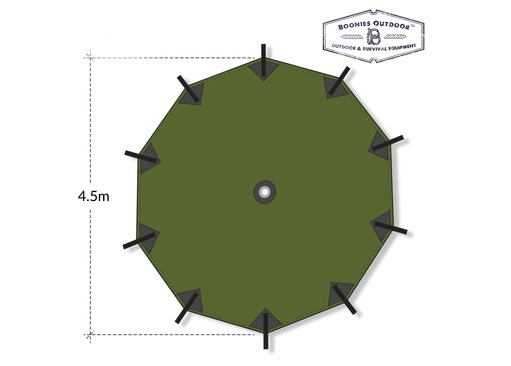 Boonies Outdoor extra-large shelters have been designed around the needs of Forest School Groups and Scout Troops or anyone who needs a reliable outdoor canopy that can be hoisted above the tall branches of the woodland and spread out creating a massive outdoor shelter. Each round group shelter has been designed with portability in mind, so there are no massively big and difficult to transport tarps that weigh too much to hoist and often collapse when wet - our largest round tarp weighs under 3000g! 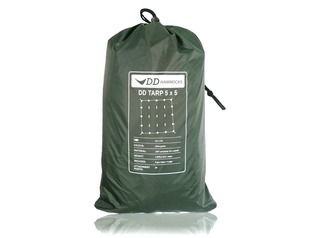 Our round tarps are excellent for forest schools, scout troops and outdoor gatherings. We have two versions of our Group Shelters, the 4.5m and the largest 6m parachute tarpaulin. 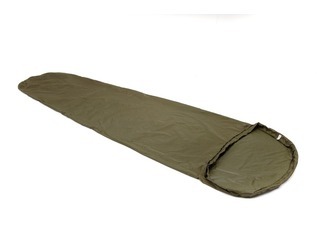 Each tarp is made from 190T polyester with a PU Coating of 3,000mm (100% waterproof). All seams are fully taped, meaning that they are strong and reliable. 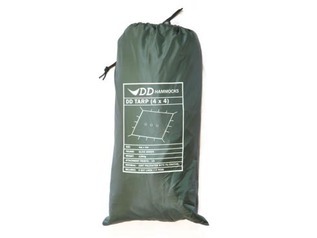 Forest School Group Tarps are supplied in our woodland green colour which is a more natural green than many tarps and one that blends into a British woodland environment nicely. The central eyelet has been patched with PVC and reinforced, making it stronger than a conventional top 'loop' as this is where the majority of the stress will be applied. The Tarp can be released from the underside of tarpaulin should you need to, which under some circumstances is more convenient. The central hole may also be used with a central pole, which is not possible with outer webbing loops. 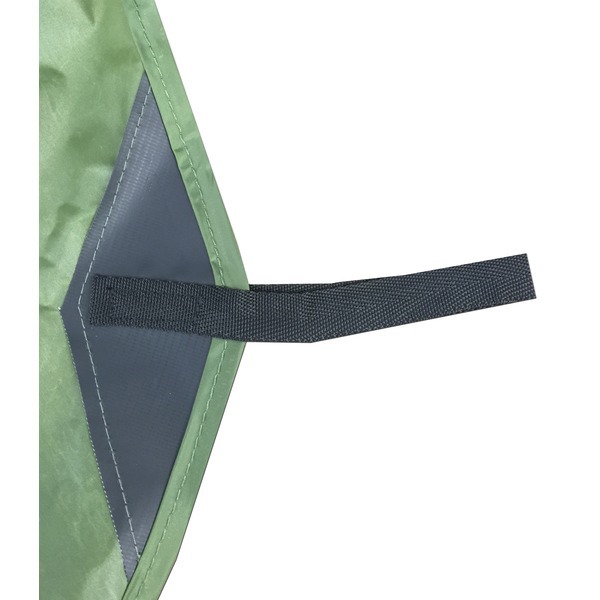 The central hole allows air to pass from the parachute tarp when being folded for storage, meaning that large pockets of air are minimised as much as possible. 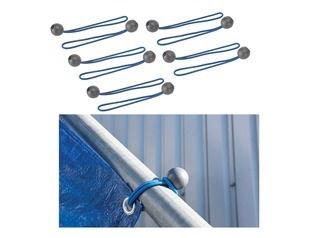 There are 10 guy line fixing points on the 4.5m version of the round tarp, and there are 14 attachment points on the 6m version. Each guy line point has been reinforced with PVC patches, maximising the strength for each point. 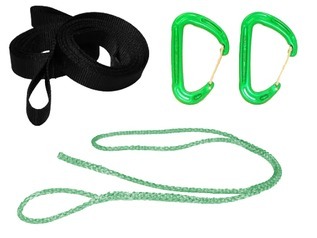 We recommend our genuine 550 paracord to use as guy lines. We don't recommend lighting fires under the tarps - or any tarp for that matter! 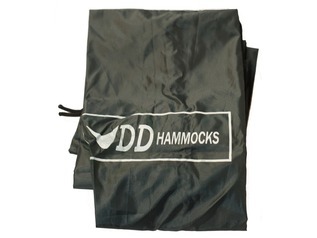 Due to the size of these tarps it is essential that they are made from a light specialist tarp fabric to make them useable, much like the material used for parachutes. Central Eyelet: Yes [approx. 17.62mm diameter]. "I ordered one of the Boonies Outdoor tarps due to the size that I required for an outdoor event, so I opted for the 6m version. WOW! What a great tarp for the job in hand. I simply hoisted it into the trees from the central hole (harder wearing than a loop) and away we went. I've also used it with a wooden pole (cut from a woodland). The above review mentions the bag was tight - I can only think they have redesigned these as they easily fit back in there and the compression straps hold it firm. 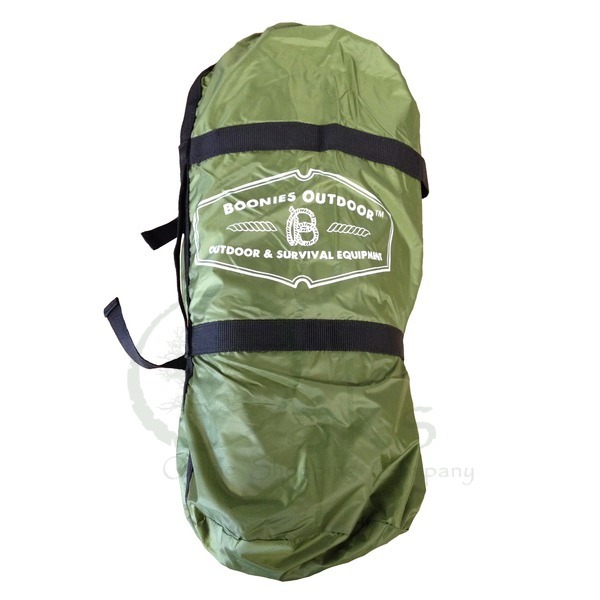 Another great product from Boonies Outdoor and excellent service from forest school shop. Thanks." "The parachute trap is superb. Very well made, secure fixing points and material that will definitely stand up to a shower or two. If you are any bigger than a small family group, go for the 6m rather than the smaller one. One niggle. Like many storage bags, it is cut to fit when the tarp has been made, machine folded and compressed in the factory. So much so that it 'peeled' open the first time. It was so tight, it was difficult to get out first time and impossible to put back in despite much rolling, squashing and sitting on. Once guylines are added, there is no hope of getting it back in. In summary, wonderful tarp. Would I buy again? Definitely yes. But the bag is now relegated to storing spare guys and pegs and I will have to buy a new bigger bag for the tarp. "